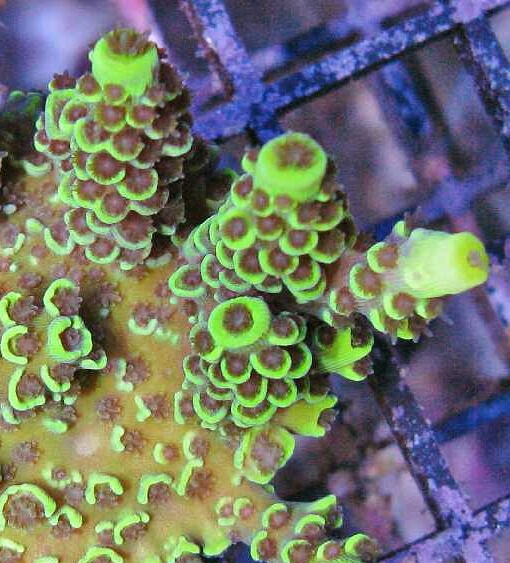 Under regular metal halides the Yellow Matrix Acropora appears to be fluorescent green with some yellow highlights on corallite ridges. When placed under Blue LED lights the coral can appear bright fluorescent yellow in color. These fluorescent colors come from the corallites which are large and flared into what has been previously called the matrix pattern. Josh at Gonzo Coral Frags acquired the original Yellow Matrix Acropora colony in a transhipment from Indonesia. Josh recommends strong light levels as well as strong water current flow. Reeffarmers is maintaining a seed section of this coral in a 8 foot Raceway Gyre BiZonal system. This system is naturally filtered with a semi-cryptic zone and a reef flat exposed zone. In this captive reef the coral is positioned to receive moderate to strong light and moderate to weak current. The first edition fragment of this coral was sold on our Buy It Now web page on November 4th 2014. Retail price was $80 for a small fragment.